The eldest discovered Eaid ancestors were from Ireland. Edmond Eade & Eleanor Hare were married in 1832 in Waterford, Ireland. Edmond (born in 1807) was 25 & Eleanor was 21 (born in 1811), and both were born in Waterford, Ireland. 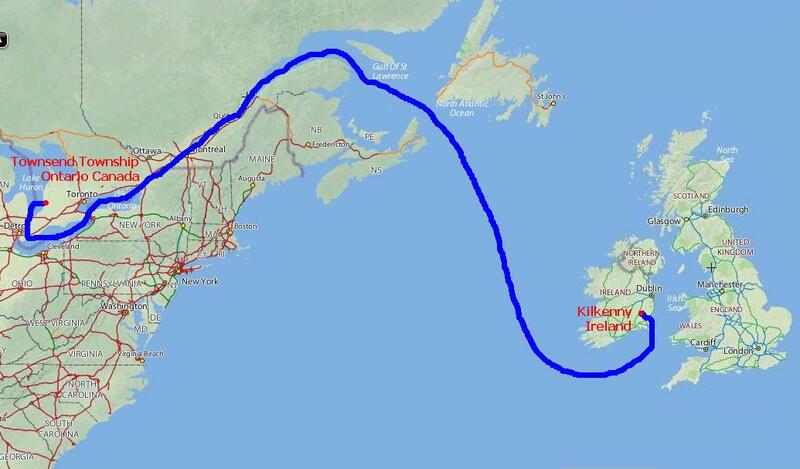 During the midst of Ireland's infamous Potato Famine, Edmond emigrated from Ireland to the USA in mid-February 1849. They arrrived into New York City NY on the packet ship Ivanhoe from Liverpool as steerage as a family of seven of 395 total passengers. Edmund (40) was listed as a labourer and had children Mary (12), John (12), Edward (10), James (8), Elizabeth (6), and Thomas (3). 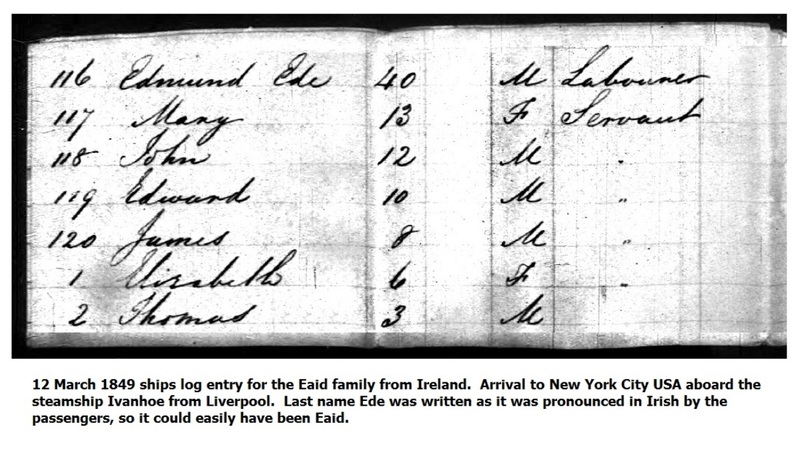 The last name on the ship’s log was Ede, written as it was pronounced in Irish as they boarded, so it could easily have been Eade. When Edmond decided to leave Ireland his first wife Eleanor did not accompany the family. Interestingly, there were three additional children with Edmond: Mary, Edward, & James. These young kids may have been Edmond’s nephews that were given the chance to come to America. 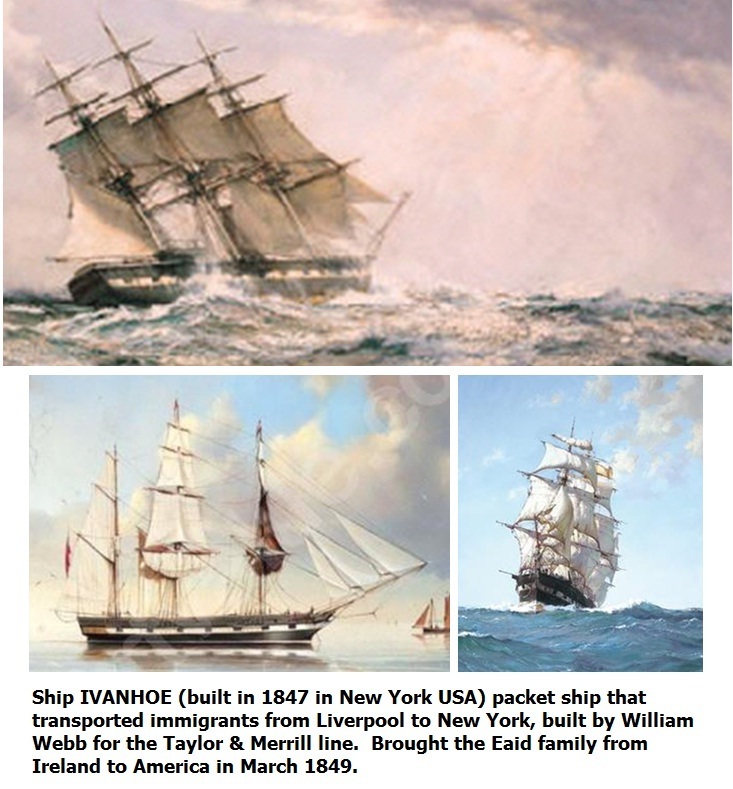 The ship Ivanhoe was an American-built packet ship that transported immigrants from Liverpool to New York. Built in New York by William H. Webb for Robert L. Taylor & Nathaniel W. Merrill's line (called the Black Star Line in Liverpool) it was launched in 1847 and was 190 feet long. The wooden three-masted barque was the most common type of deep-water cargo-carrier in the middle of the 19th century. Captain S.C. Knight (Great Britain) was the captain for the Eade’s voyage to America. Ivanhoe was very strongly built and lavishly fitted out with elegant staterooms and a 40 foot dining room. Her average time for an Atlantic crossing was twenty-three days eastward and forty days westward bound. Edmond Eade became Edmund Ede and When they eventually made it west into Ontario Canada he was officially listed as Edward Eaid in 1852. The family rumors claim Edward fled Ireland to avoid prosecution after his brother was hung as a horse thief. Edward was also rumored to be a famous concert violinist before coming to North America. 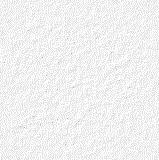 Edward's family is listed in 1852 Canada Census living in Norfolk County, Townsend Township in Ontario Canada with his three children but no wife and his occupation was a sawyer (lumberjack). Edward's oldest son John is first listed in the 1871 Canadian Census at 33 years old working as a farmer in Townsend. The first Eaid's in our lineage to live in America was John who's family is listed in the 1880 US Census living with their 8 children in Mecosta, Michigan. It shows the family moved from Canada to Michigan between 1872-76, as William was born in Canada in 1872 and Clayton in Michigan in September 1876.